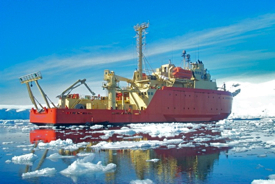 A team of researchers led by professor Deborah Steinberg of the Virginia Institute of Marine Science leaves tomorrow for Antarctica and their annual 6-week field season aboard the research vessel Laurence M. Gould. This year's expedition is the subject of Antarctic Quest, a documentary film focusing on the drastic changes in ice cover and marine life experienced by Steinberg, Oscar Schofield of Rutgers University, and other long-time Antarctic researchers. 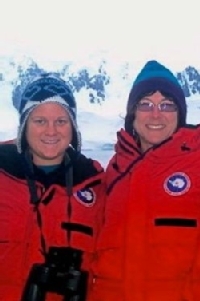 Schofield and Steinberg first visited Antarctica as undergraduates in 1987. Partly funded by the National Science Foundation, the film is being produced by Rutgers University's Film Bureau and Institute for Marine and Coast Sciences in conjunction with other PAL-LTER partners. As they do each field season, this year's VIMS team will collect zooplankton at a series of sampling stations in the waters along the west coast of the Antarctic Peninsula to better understand how climate change is affecting the microscopic animals that form the base of the Antarctic food web. The expedition is part of the Long-Term Ecological Research Program at the U.S. Palmer Research Station on Anvers Island. The PAL-LTER program is headed by former VIMS professor Hugh Ducklow, and funded through competitive grants from the National Science Foundation. "We're interested in zooplankton for two main reasons," says Steinberg. "First, changes in their abundance and species composition ripple up the food chain to affect fish, penguins, and whales. Second, they play an important role in the ‘biological pump,' potentially helping to move carbon dioxide from the atmosphere into the deep sea where it contributes nothing to global warming." Annual winter temperatures along the Antarctic Peninsula have increased by 11°F during the last 50 years, 5 times the global average warming. Researchers with the Palmer LTER program have monitored this change since 1991, and are now focusing their studies on how the rapidly warming climate is affecting sea ice and marine creatures in the region. In the 37 years since researchers first started counting Adélie pen­guins in the area, the number of breeding pairs has declined from around 35,000 to 5,600, a drop of more than 80%. Steinberg is accompanied on this year's expedition by VIMS graduate students Brandon Conroy, Miram Gleiber, and Josh Stone; recent post-doctoral researcher Kim Bernard; marine technicians Joe Cope and Kate Ruck; and William & Mary undergraduate Domi Paxton. Gleiber is studying the long-term changes in the abundance and distribution of copepods, small crustaceans the size of a rice grain that form the base of the Antarctic food web and play an important role in the cycling of carbon and other nutrients in the marine ecosystem. She first took part in the PAL-LTER project as a W&M undergraduate in 2009, and will again be blogging about her experiences in the Southern Ocean. Bernard, who has been at Palmer Station since late November, is studying how changes in krill populations might be affecting penguins and other krill predators farther up the food chain. Krill are the keystone of the Antarctic coastal ecosystem. Cope, in his fifth Antarctic field season, is an expert in identifying Antarctic zooplankton species, and helps to operate the team's lab equipment and high-tech sampling nets. These MOCNESS devices (for Multiple Opening and Closing Net and Environmental Sensing System) have a series of separate nets that can be remotely opened and closed to allow for collection of zooplankton from specific depths. Conroy, Ruck, and Stone are serving as field assistants. Gleiber and Stone's participation in this year's expedition is partly funded by a private gift from Adrian G. "Casey" Duplantier, Jr., matched by 1st Advantage Federal Credit Union. The Duplantier/1st Advantage gift has allowed one VIMS graduate student and one W&M undergraduate to conduct research at Palmer each year since 2007. Previous gift recipients are VIMS graduate students Lori Price, Kate Ruck, Glaucia Fragoso, Heidi Geisz, and Noelle Yochum; and W&M undergrads Domi Paxton, Caitlin Smoot, Sarah Giltz, Miram Gleiber, Erin Morgan, and Julian Ma.